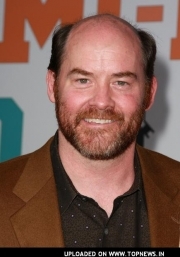 David Michael Koechner is an American comedian, musician, and character actor. Koechner began studying improvisational comedy in Chicago at the ImprovOlympic, under the teachings of Del Close, before joining the Second City Northwest. After one-year stints of doing sketch comedy on Saturday Night Live and Late Night with Conan O'Brien, he began taking small parts in films such as Man on the Moon and Wag the Dog. While filming the country mockumentary Dill Scallion, Koechner befriended Dave 'Gruber' Allen, forming The Naked Trucker & T-Bones Show. The act became a hit at Hollywood clubs such as Largo, and the duo were invited to open for Tenacious D.
Koechner appeared frequently with larger supporting roles in many high profile comedic films including Anchorman, Talladega Nights, The Goods: Live Hard, Sell Hard, and Extract. On January 17, 2007, Koechner's Naked Trucker & T-Bones Show premiered on Comedy Central, giving him a starring role and full creative control. His first leading role, as Coach Lambeau Fields in Fox Atomic's sports comedy, The Comebacks opened on October 19, 2007. Koechner was born in Tipton, Missouri, the son of Margaret Ann (née Downey) and Cecil Stephen Koechner. His father ran a business that manufactured turkey coops (Koechner has stated that "If you see a turkey going down the road in a big truck, most likely its coop is from Tipton..."). He was raised in a Catholic family of German and Irish descent. Koechner studied Political Science at Benedictine College and the University of Missouri, and decided to pursue a career in sketch comedy and moved to Chicago. After studying at Chicago's ImprovOlympic, under famed improvisation instructor Del Close, Koechner joined The Second City comedy troupe in Chicago, graduating in 1994. In 1995, Koechner landed a year-long stint on Saturday Night Live, joining the show with fellow Second City friends Nancy Walls and Adam McKay. During his time at SNL, he befriended guest-writer David 'Gruber' Allen, and fellow castmate Will Ferrell. Some of Koechner's recurring skits included Bill Brasky, the British Fops , Gary Macdonald (the fictional younger brother of Weekend Update anchor/SNL castmember Norm Macdonald, based on "Jokey", a character he originated at Second City), Will Ferrell's "Get Off the Shed" sketches , and Gerald "T-Bones" Tibbons. On the show, Koechner also impersonated several celebrities, including Burt Reynolds, Mike Ditka, Charlie Sheen, Robert Shapiro, Willard Scott, Oliver Stone, Phil Gramm, David Kaczynski, and Pat Buchanan. After his one season on SNL, Koechner joined the 1996–97 sketch cast of Late Night with Conan O'Brien, where he was perhaps best remembered in the NBC Gargoyles recurring sketches, pairing Koechner with Conan regular Brian McCann as two obnoxious Gargoyle statues often perched outside Conan's desk window. In the late 1990s, Koechner took several minor acting roles in films such as Wag the Dog, Austin Powers: The Spy Who Shagged Me, and Man on the Moon. Koechner is married to actress Leigh Koechner and has five children, his 2 youngest are twins Sargent and Audrey, born 2 June 2006. He also performs regularly in Los Angeles at both the ImprovOlympic West theater , and at Largo, the nightclub where the Naked Trucker Show plays regularly. David Koechner supported the 2004 Presidential campaign of John Kerry, performing at a June 6, 2004 Hollywood fundraiser for the Senator, where The Naked Trucker & T-Bones opened up for Tenacious D. Koechner cites Lou Reed, Iggy Pop, Uncle Tupelo and its off-shoots as some of his musical favorites. He also strongly admires Creedence Clearwater Revival, whom he has described as, "the American Beatles." Whole or part of the information contained in this card come from the Wikipedia article "David Koechner", licensed under CC-BY-SA full list of contributors here.